HONOLULU – USDA’s prestigious Two Chiefs’ Award was presented to M. Irene Sprecher of Hawaii’s Department of Land and Natural Resources. Ms. Sprecher played a lead role in the development of the “Collaboration on Forestry Related Program Delivery in Hawaii” Memorandum of Understanding (MOU) between the USDA NRCS, the Forest Service, the Hawaii Association of Conservation Districts and the State’s Department of Land and Natural Resources – signed May 19, 2011. This MOU was derived from the National MOU that is used for the same purpose and was signed September 29, 2008. Since the implementation of the Hawaii MOU, the partners have significantly improved their communication and interaction with each other, and cooperated to coordinate the delivery of several Landowner Assistance Programs in Hawai’i. Through this MOU, a landowner who obtains an approved Forest Stewardship Program management plan may access multiple programs for forestry conservation assistance – Forest Stewardship Program, the Conservation Reserve Enhancement Program (CREP) and/or the NRCS Environmental Quality Incentive Program (EQIP). This has significantly streamlined the process for landowners to access assistance funding, while simultaneously improved the collaboration among Agencies and efficiency of their programs. While this MOU is in place at the national level, not all states have implemented a state-level process, and most of those that have received some financial support to make it happen. Hawai’i has achieved a unique distinction in accomplishing all of this with no extra funding provided by or given to any of its MOU partners. The MOU partners are involving existing staff only and are motivated simply to improve all aspects of private landowner assistance in Hawaii through increased cooperation. 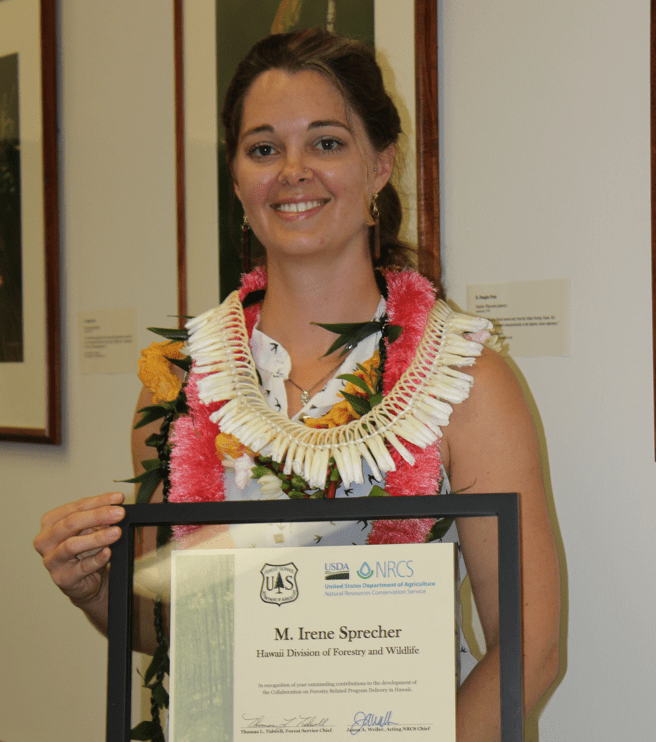 Ms. Sprecher was a major contributor towards the establishment of the Conservation Reserve Enhancement Program in Hawaii. (see website at http://dlnr.hawaii.gov/forestry/lap/crep/ ). That process required extensive collaboration and negotiation with national and local partners in order to customize the program to best serve Hawaii, and to obtain all the required approvals. In addition, she has been very cooperative in modifying the Hawaii Forest Stewardship Program (supported via State and USFS funding) to come into alignment with the conservation practices, technical specifications and cost share rates associated with NRCS’s EQIP. Similarly to the Forest Stewardship Program’s management plans, this has made various Federal and State forestry conservation assistance programs work in parallel, with a consistent look and process for our prospective cooperators.